By the early 1850s the Tasmanian economy was booming. Tasmania's exports were in demand from mainland colonies, as well as from Britain. Following the restructure of the economy in the 1840s, the agricultural sector was becoming more efficient, and there was a move into small-scale factory production, notably jam making and fruit processing. The success of shipbuilding encouraged the development of related industries, most based on the use of the steam engine. The boom, however, was short lived. By 1858, Tasmania was once again in recession. Inflation was unsustainably high, there was a financial crisis in Britain and local demand was in decline. Population loss had accelerated following the discovery of gold in California and Victoria, and this continued into the 1860s with the opening of goldfields in New Zealand and New South Wales. This exodus coincided with a sharp downturn in demand for Tasmania's exports from other Australian colonies, and the disruption of trade with Britain that occurred during the American Civil War. By 1865, Tasmania's export trade in timber, whale oil and wheat had collapsed, wheat and wool production had fallen dramatically, and the value of imports had declined to half that of the 1850s. A year later, Tasmania's most important market – Victoria – adopted a protective trade policy, raising tariff barriers to colonial trade. While the economic downturn affected all Australian colonies, in Tasmania its impact was more acute and prolonged, reflecting the colony's dependence on exports. Overseas investment in Tasmania steadily declined and between 1853 and 1870 there was a dramatic reduction in capital inflow from Britain. Wages fell faster than prices and standards of living declined. 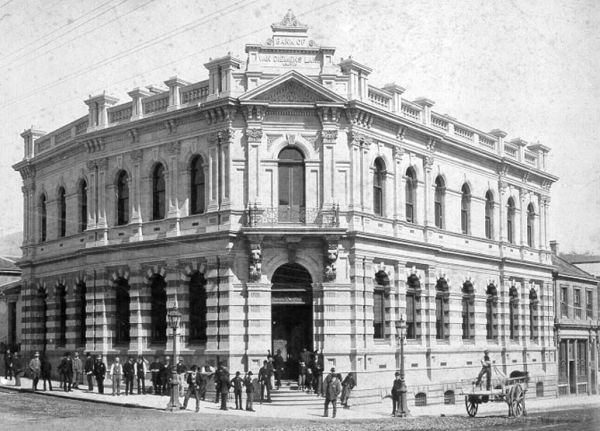 By the 1870s, the Tasmanian government had become more proactive in intervening in the economy. In 1868 it had gained access to large loans on the London market. These funds were used to accelerate investment in infrastructure – road, rail and telecommunications – and support was given to encourage private investment in mineral exploration and mining development. Shipping costs were coming down. Communication with markets in Britain and Europe had improved as a result of the move to clippers and steamships, the opening of the Suez Canal and the completion of telegraph links. By 1880, with demand for Tasmania's mineral exports high, the colony was in the midst of a full-scale boom. In the ten years since 1870, the population had not only increased by 27 percent but also, with the opening up of the agriculture, timber and mining areas of the north-east, north-west and west, its regional distribution had altered. Ten years later, the Van Diemen's Land Bank collapsed and, along with Tasmania's key export markets, the colony slipped into depression. There was a brief recovery between 1896 and 1900, but by Federation Tasmania's economic trends were not promising. The mineral boom was largely over. Under conditions of interstate free trade, Tasmania's secondary industry could not compete. In longer-settled areas, soil exhaustion was apparent. Potato blight in the north-west decimated production and farmers were converting to dairying. The timber industry was poorly organised. The federal government's adoption of protective trade policies was a major setback for the Tasmanian economy. The introduction of scientific methods into the agricultural and pastoral industries had begun in the 1890s, and government increased its support during the early years of the twentieth century. During the First World War, due to the federal government's special grants and war contracts, primary industry did well, but the rest of the economy was not as fortunate, particularly the mineral and timber sectors. Access to overseas loans was interrupted, machinery imports were delayed, slowing down the completion of the hydro-electricity scheme and associated secondary industries. During the immediate post-war years, the overseas apple market collapsed when growers could not get space on ships. Shipping costs increased. By the 1920s, hydro-electricity was available and five new large-scale industries were in operation. With both federal and state agricultural policy favouring closer settlement schemes as a way to economic recovery, funds were being directed to support the resettlement of soldiers. However, by 1923 the Tasmanian economy was once again in decline, with population loss reaching 'alarming proportions', according to Sir Nicholas Lockyer. In his 1926 report on Tasmania's financial position, Lockyer was critical of the government's approach to economic development, and identified the need for increased investment in primary industries – agriculture, horticulture, pastoral, mining and timber. By 1930, Tasmania, like the rest of the world, was on the brink of the Great Depression. Further reading: Tasmanian government reports 1850–1930, Parliamentary Papers passim; N Lockyer, Report on financial position of Tasmania as affected by Federation, Melbourne, 1926; R Hartwell, The economic development of Van Diemen's Land: 1820–1850, Melbourne, 1954.